Writing the story of my family's journey north, has set me to thinking about stories about my grandparents. 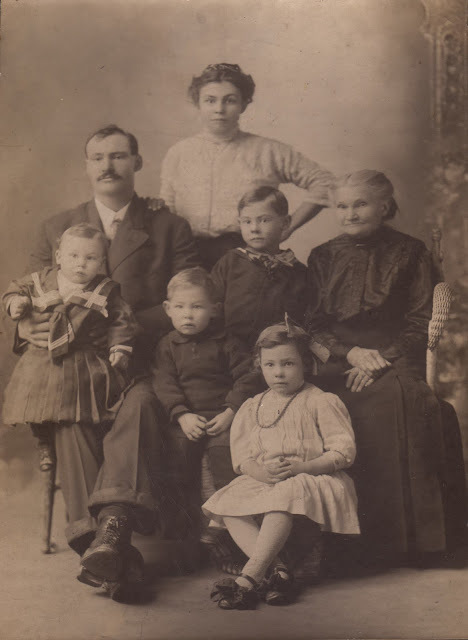 Here is a picture of them with their first four children and my grandfather's mother. in the hotel they ran. Baseball was the passion of the day. Belle was ten years younger. but she was to young for him. but he was to old for her. and even deeper into the bottle. Walter discovered what was going on. Married her to get her out of there. Here is a link to blogs of other participants in this challenge. 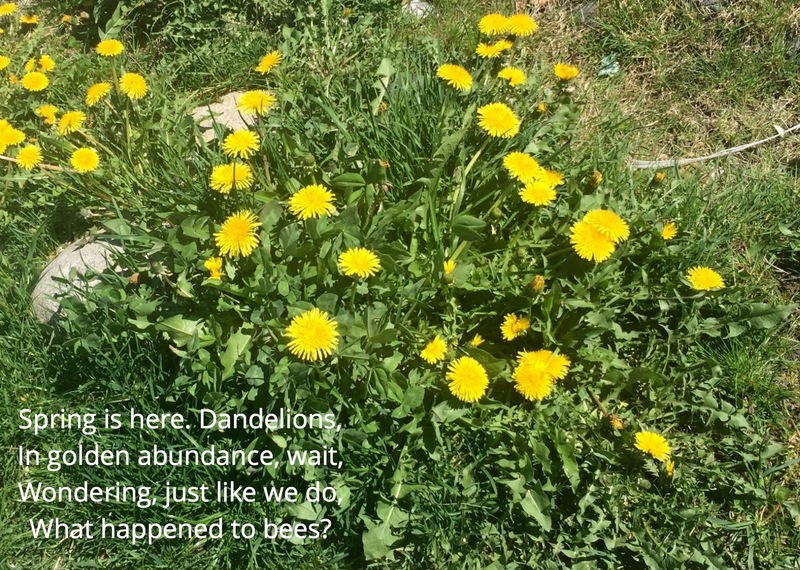 Last Saturday, while Hoyoun, Ada and I were out walking, we admired a lot full of dandelions. It was eerily silent without the buzz of bees. For the rest of our walk, we searched for them in every clump of flowers. Eventually we found one. 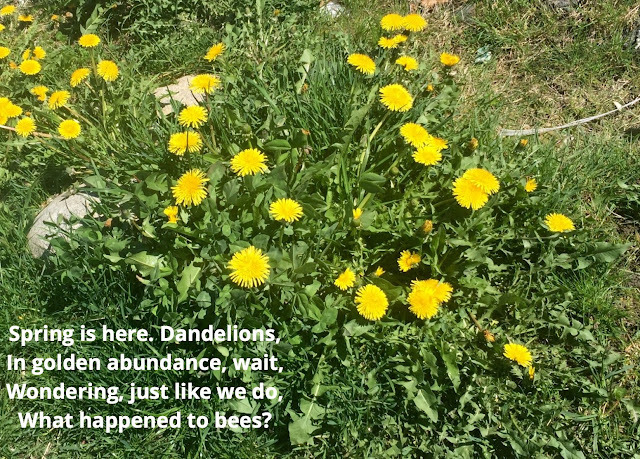 I have been trying to come up with a poem for dandelions and the missing bees ever since. I ended up with using a dodoitsu format you can read about here. I'm planning on posting a poem that is part of a collection of poems about climate change, but a lot can happen between now, as I write this Sunday evening, and when I wake up Monday morning. 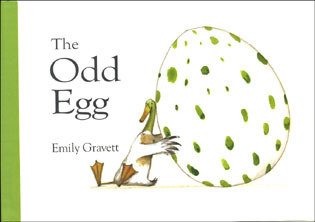 As a nod to Easter reading, I picked up a couple of books with egg related themes when I was at the library Saturday with my granddaughter and daughter-in-law. Otherwise, we didn't make a big deal about the season this year. I made dinner and dessert of pavlova with lemon curd. Our house has been chocolate free! Hurrah! The poem a day challenge is almost 3/4's over. 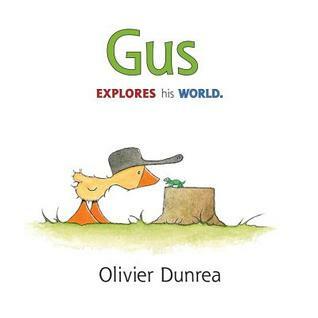 I am in the middle of an obsession with Olivier Dunrea's picture books. 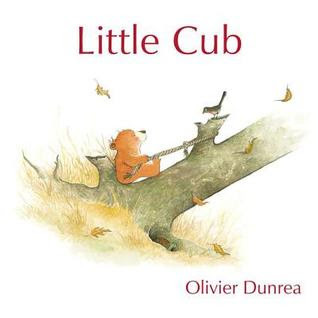 My grandchildren are a bit young for this one as it has more text, but I am sure that slightly older children will love this story about a little bear who is on his own. He doesn't like being alone and wishes he had someone to take care of him. Old Bear is also alone and doesn't like it. He too wishes he had someone to take care of him. I'm now waiting to read Old Bear and His Cub. I enjoyed this little board book more than my granddaughter did, but maybe it was just not the right time for her. Gus is a thoughtful loner spending his time watching the world around him. Then he discovers a clutch of eggs. 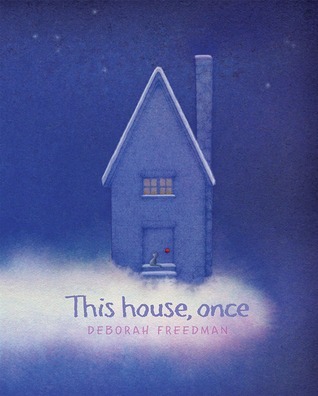 I might be more dark and twisted than I thought, but I loved this book. All the other birds have laid eggs except Goose. Then he found an egg and fell in love with its beauty, certain it was the best egg ever. Long after all the other eggs had hatched, goose waited. It’s quite the surprise when the egg finally does crack and open. I was sad that the end papers were covered in my library copy. I had to work hard to find the final, hilarious surprise! This is a kind of house that jack built, only it references where the different parts of the house came from. The illustrations are divine, but I was confused by what was going on at times. 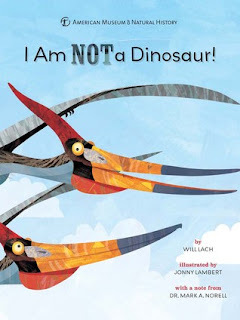 This book introduces readers to numerous animals often mistaken for dinosaurs. I loved it for many reasons. First, the main part is written in poetry. Second, it's nonfiction. Third, Jonny Lambert's art is equal to Steve Jenkins work. Fourth, the back matter is full of additional information about each animal. There is a section titled, What is a Dinosaur? It also includes a timeline showing the epochs each animal existed. These poems are pure delight! They are also twisted and somewhat warped. I'm looking forward to sharing some of them with students this coming week. The section of poems on glasses inspired me to write my own poem this week! You can read it here. The writing in this novel is exquisite. 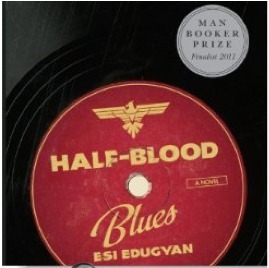 It's the story of black Jazz musicians living in Europe at the time of the second world war. It's a powerful story about betrayal and redemption. The list of awards this book has won, or was nominated for, tell you how potent it is. 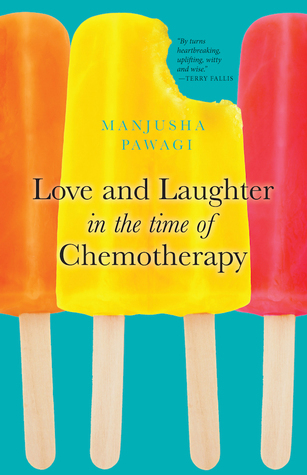 This memoir deals with the time the author was diagnosed with leukaemia and the treatment regime she had to endure to get rid of it. It's loaded with gruesome details, truly wretched experiences and episodes of black humour. I knew that the treatment for cancer was harsh, but before reading this book, I really didn't understand what that looked and felt like. It is beautifully written. I stopped and wrote out a number of passages. Throughout this memoir, what struck me most was the strength of the relationships she began with, and those she forged during her horrific marathon. I leave you with this quote from the book. I am listening to Bury Your Dead by Louise Penny and reading, with my eyes, Girl in Pieces by by Kathleen Glasgow. The latter has been on my #MustRead list for the last couple of years. I am so glad to finally get to it. The next audiobook will be Property of the Rebel Librarian (if it becomes available.) I'm eyeing Ash Boy: A CinderFella Story as a break from the intensity before starting Watch Us Rise by Renée Watson. 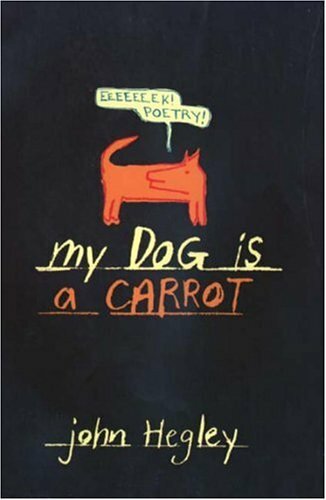 This poem was inspired while reading My Dog is A Carrot by John Hegley. He has six poems in it about glasses that tickled my fancy. While reading them, I remembered an episode in my teen years when my sisters and I lost our glasses. I let the idea percolate for a bit before sitting down and starting writing. John Hegley's poetry is full of humour. In his honour I've tried to write a poem that might make you smile. High ho! High ho! High ho! High ho! Into the mountains we did go. and so a stop we did make. The day was hot and so were we. Off went our clothes, one, two, three. leaving our glasses there behind. till someone knocked them off that ledge. Down, down to the deep they went. A lot of money the folks had spent. while we meandered nearly blind. leaving our parents poor and aggrieved. to leave our glasses on the shore. our glasses are there but not forgotten. A Skinny is a short poem form that consists of eleven lines. The first and eleventh lines can be any length (although shorter lines are favoured). The eleventh and last line must be repeated using the same words from the first and opening line (however, they can be rearranged.) The second, sixth, and tenth lines must be identical. All the lines in this form, except for the first and last lines, must be comprised of ONLY one word. The Skinny was created by Truth Thomas in the Tony Medina Poetry Workshop at Howard University in 2005. They are poems about social issues. With the recent elections of right wing political parties here in Canada, here's mine. What do we lose when they win? Poetry Friday is hosted today by Amy Ludwig VanDerwater at The Poem Farm. 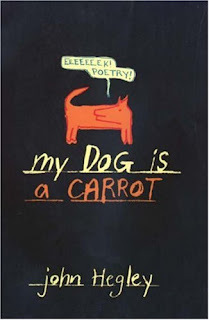 Make sure you read her ongoing story poems about John and his dog, Betsy, and check out her page for links to more poets sharing work today. In 1958, when I was five years old, my parents and other relatives set out on a great adventure north. I have been writing bits and pieces about that time for a while. Over the last couple of years, and as I write more, I interview remaining family members for more details and stories about their experience. To motivate myself to write, I plan to post bits and pieces of their saga here every Friday. They might not be in any kind of order. I'm just hoping to get some kind of reasonable drafts out there. I hope for feedback both on the construction of the poetry, and more details from family. This is the third instalment. You can read the first one here and the second one here. Links to my previous April poems can be found here. Here is a link to blogs of other participants in the poem a day challenge.